Welcome back to another WIP Wednesday in KatersAcres polymer clay studio. Today not only will you see some things I’ve been working on, but you’ll also get a few of my recommendations as well. 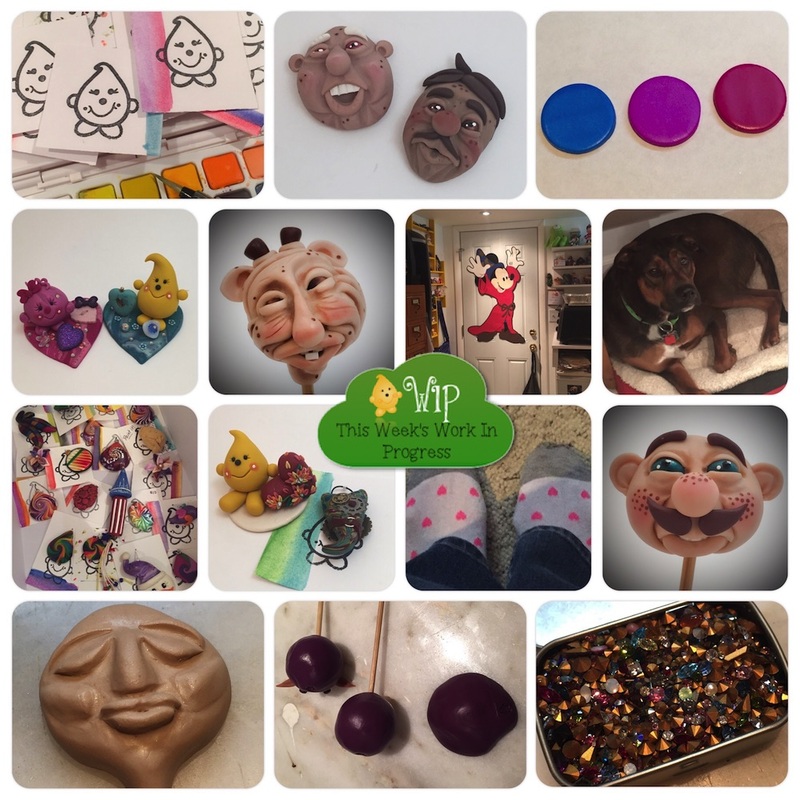 ENJOY and don’t forget to join me in Parker’s Clay Tribe, a free polymer clay FaceBook group. Once again, I’ve really been enjoying making fantasy faces. I have really enjoyed the process. It’s one of my challenge objectives for the 2016 Polymer Clay Challenge. Do you want to join us in the challenge? Click the link for more details on what it is and how you can join too. For many of my swap items and freebies, I make little cards using Watercolors and my Parker stamp. Then each of these small gifts get mounted to the cards that coordinate with the item. This week I wrote an informative article on how to make new clay colors for those who have never done it. You can see that post here. The little Parker & Lolly on hearts were sent to my swap partner for the HOP! FaceBook Group. I hope she likes them. This ogre face was a completely failure and great learning lesson. I was trying to make him look like his mouth/face was squished to one side and contorted that way … however, when he was done I feel like he looks more like he has elephantitus. I suppose on a fantasy ogre, it’s not that bad … but I still don’t like him. I now have a giant Sorcerer Mickey on the back of my studio door, thanks to a very talented paper crafter and friend for my surprise 35th birthday. Soon to be added … broomsticks! This is the box of freebies and swap gifts I send with my Swaps. This box is filled with fun stuff I make with cane ends, scraps, and even tutorial project samples too. This Parker with heart and steampunked heart I sent to my PCT February Swap partner. I hope she likes them! And here’s a picture of my tootsies … why, well because this picture was taken on my 35th birthday and I take pictures of every place my feet have been. This face, Bernardo, is one of my favorites this month. This big nosed, Italian man stole my heart this month! I love him. I’m working on a new PDF project for you, this one is “goddess” themed and I’ll show you how to make your own goddess face and even mold it so you can make oodles of them. Be sure to see this photo on instagram where I give you a TIP for making your own molds. Last but not least, I am absolutely head over heals for these GORGEOUS Chatons from B’Sue Boutiques. WOW! You will not believe the brilliance and sparkle. I think I’m going to need more. Get your own here.